Home > Your Questions > When Shouldn’t I Use Shrink Wrap Scaffold Cladding? When Shouldn’t I Use Shrink Wrap? Wet weather affects the scaffold shrink wrap process in two ways. 1) Welding: If rainwater gets in between two sections of shrink wrap that need to be welded / joined together, it becomes difficult to heat the shrink wrap (using the propane shrink wrap gun) sufficiently for the shrink wrap to stick / weld together properly. This is less of a problem when hanging sheets around the sides of a scaffolding structure, as any water will tend to run away down the sheet, but rainwater inside the ‘weld’ can be a particularly problem when trying to make joints between sections of shrink wrap sheeting when creating temporary roofs. 2) Heat Shrinking: If rainwater is covering the shrink wrap sheeting during the final heat shrink process, although the sheeting may shrink tight, the shrink wrap may have a ‘speckled’ appearance where water droplets prevented the hot air properly reaching the scaffold wrap film. This is more of an appearance issue but it is worth being aware of it for those jobs where the appearance of the scaffold sheeting is important. Whilst wet weather can be inconvenient, windy weather can make fitting shrink wrap sheeting very difficult. What is windy? Well, for shrink wrapping it is normally considered ideal conditions if the winds are 10mph or less but depending on location, still achievable if the wind is gusting up to 20mph. 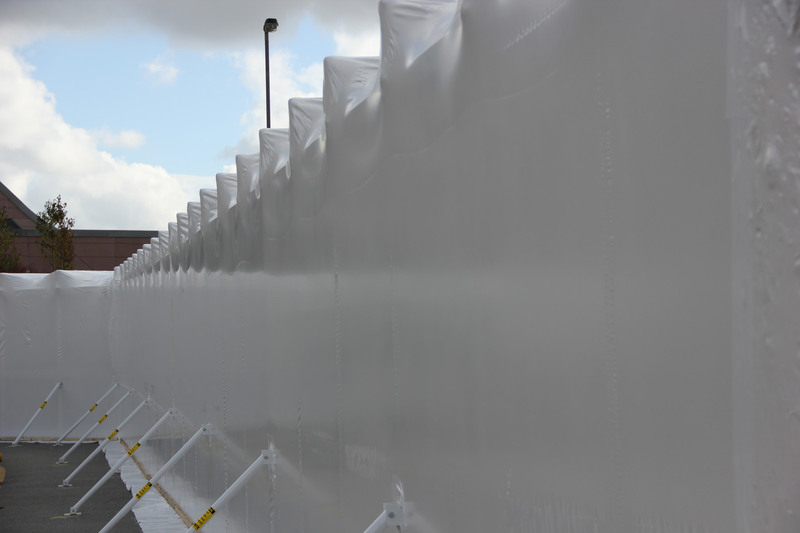 Windy conditions affect the scaffold shrink wrap process in two ways. 1) Fitting: Most scaffold shrink wrap installers use a 7m wide x 15m long shrink wrap roll which is typically used to cover a vertical height of 3 lifts or 6m. Windy and gusty conditions make it difficult to unroll, fit and temporarily clip a sheeting section of this size (approx. 100 m2) with sufficient tension. Although the heat shrink process does remove slack, if the sheeting is not fitted with enough tension to begin with then it will not be tight enough after heat shrinking and the strength of the film will be affected. 2) Heat Shrinking: After fitting and heat welding into place, the final stage of the shrink wrap process is to heat shrink the entire sheeted area ‘drum tight’. This involves using a propane gas heat gun to heat the area. The operator holds the gun around 40cm from the shrink wrap sheeting and uses a motion similar to spray painting. As the film is heated it initially becomes soft and flexible, as the shrink wrap cools it shrinks until the sheet is taught and tight. However when shrinking the film in windy conditions, a hot area of the shrink wrap can be blown into a bubble and even create a large hole. Although the strength & integrity of the whole sheet will not be affected and it is possible to patch this hole from the inside with another piece of shrink wrap film, the appearance of the finished job will affected. Although shrink wrap sheeting material costs from £1.35/m2, shrink wrap will never be able to beat traditional scaffold sheeting on price alone. With scaffold shrink wrap there will always be some extra labour costs for fitting it and the requirement to purchase some shrink wrap heat gun(s) and possibly some training for your team. Clients who need the extra performance of scaffold shrink wrap, generally understand the extra costs involved. However, if you just need a ‘bit of sheeting’ for a client who wants the lowest price at all costs then probably a traditional scaffold sheeting product is a better option. The ability of scaffold shrink wrap to withstand high winds derives from it’s ability to be heat shrunk ‘drum tight’ around the scaffolding structure and to do this requires hot air to be blown across the surface of the sheet and this requires a hot air gun! Shrink wrapping guns are usually powered by propane gas as this creates a powerful heat source that is able to shrink large areas rapidly. Electric heat guns are available, (such as the Leister Forte S3), but compared to a propane gas shrink wrap gun the electric tools are slow, heavy and expensive tools and are not considered of practical use for the shrink wrapping of scaffolding. Some construction sites will require a hot work permit before shrink wrapping work can commence but on some sites, most notably oil refineries and similar environments will not permit hot works of any kind whilst the plant is in operation. There have been examples of shrink wrap companies utilising a tensioning and gluing technique with shrink wrap film to overcome this ‘no hot work’ rule but it is much slower and more expensive per square metre and not suitable for a typical construction project. Traditional reinforced scaffold sheeting, at 2-3 metres wide and fixed around each lift of the scaffolding structure with bungee cords is easily removed and so ideal for situations where lots of adaptions are needed to the scaffolding structure. Once the shrink wrap has been heat welded into place, it cannot be removed and refitted. To get the full benefits from shrink wrapping, the scaffold structure should be ‘flush’ with no protruding ledgers, transoms or standards. This is particularly true where a high level of environmental containment is needed (such as a shot blasting and painting). Protruding tubes make fitting a 6-7m sheet difficult and it can be time consuming to tape around each scaffold tube protrusion. If the structure cannot be built flush, or you do not want to cut any tubes then a traditional sheeting might be a better option.